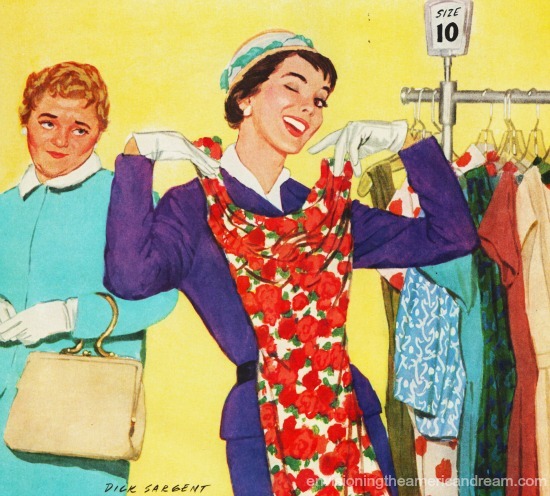 This once enviably svelte housewife now found herself among the masses of women who realized they needed to whittle their waists. For decades, Memorial Day has long been a solemn occasion. Besides reflecting on those brave souls whose lives were lost in service to their country, the holiday has also signaled the beginning of swimsuit season and with it the sobering reflection of the state of ones body as winter weary thighs and middle-aged spreads come out of hibernation. In 1965 Winnie Roberts had one such sobering experience, bravely confronting herself in the harshly lit confines of a department store dressing room. One glance in the triple view mirror and poor Winnie did a double take. The new slim fashions were not for her. Crestfallen, she knew in her heart that “her size” just wasn’t “her size” any more. Suddenly for the formerly winsome Winnie, dressing up wasn’t as exciting as it used to be. Hangers filled with this seasons must-have figure flattering swimsuits in stripes , ruffles and pleats beckoned forlornly. As she struggled unsuccessfully to wiggle into a new Rose Marie Reid swimsuit in unforgiving Banlon, her reflection in the dressing room mirror confirmed what she already suspected. It was time for Winnie to whittle her waist. There came a time in every cold war housewife’s life when the safety of the containment policy offered by a good girdle simply wasn’t enough to keep those pesky curves in line. That time had come for Winnie. Now that she was nearly 38 and officially middle-aged, the pounds didn’t come off so easily. If she wanted to compete with the Pepsi Generation, she had to do more than get with the now taste of Tab ! Is This the Day You finally Do Something About Your Weight? Back home as she carefully dusted the Kimball upright piano, dousing the pecan wood with aerosol Pledge, Winnie’s eyes fell on the array of framed family photos that adorned the top of the piano. That settled it. It was time to do something about her weight. She pledged to go on a diet. But true dieting takes will power. Those temptation hours between meals when hunger sets in, are the undoing of so many wishful weight watchers. And all those calories to count could make a gal dizzy. 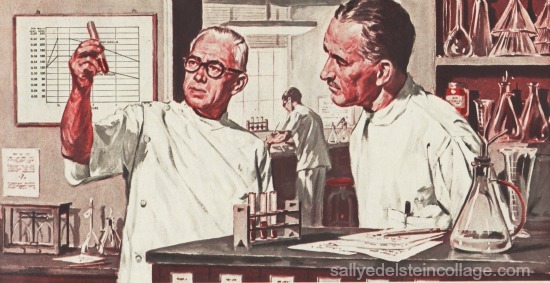 Like millions, Winnie had read Dr.Herman Taller’s hugely successful 1961 bestseller Calories Don’t Count. But even if she didn’t have a head for figures ( as her hubby always pointed out), she figured the good doctor was dead wrong. Calories did count. Lucky for her there was no shortage of new diet products to help m’ lady in her battle of the bulge. Best of all, she could leave the counting to someone else. 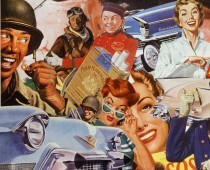 By 1965 over 5 million had been helped with that mid-century miracle – Metrecal. It was while flipping through her latest issue of Ladies Home Journal that help came to Winnie. 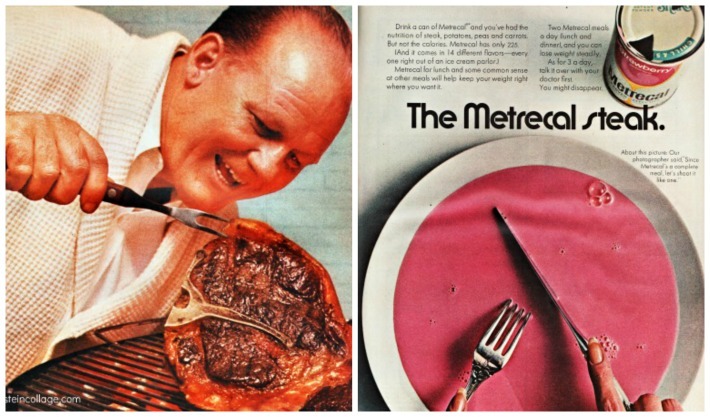 There nestled between tempting recipes for gay, festive cakes and hot day casseroles was a double page ad for Metrecal. “Is this the day You do something about your weight?” the ad’s headline asked the reader. “If you are overweight, if your clothes don’t fit right, if you don’t even feel as attractive as you should, isn’t it time you considered Metrecal? ” The copy seemed to speak directly to her. Like most savvy gals, Winnie had heard about Metrecal. 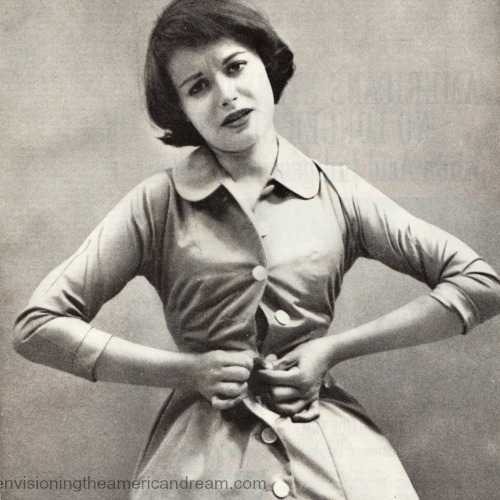 Since it was introduced in 1959, Metrecal had changed the dieting habits of the nation. The 225 calorie meal replacement drink taken 3 times a day melted the pounds in a jiff. Winnie was ready to turn her back on Lobster Newburgh for her figures sake and join the Metrecal for Lunch Bunch, sipping her way back to her former slenderella self. By the early 1960’s several liquid diet meal replacements appeared to help sip your way to slenderness. But the granddaddy of them all was Metrecal, a product of pharmaceutical company Mead Johnson & Co. Along with a generation of busy mothers, housewives like Winnie Roberts had long counted on Mead Johnson & Co, makers of Pablum and Dextri Maltose, to feed her babies. By the fall of 1960, these same mothers were buying a new Mead Johnson product, a powder called Metrecal, which promised just the opposite-to take those unwanted pounds off mama! Now women could confidently begin their own adventure with the same peace of mind inspired in millions by the name Mead Johnson & Company. 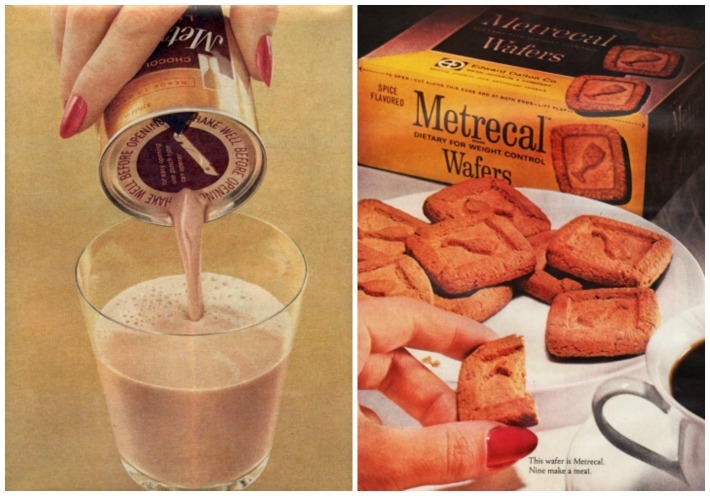 For Mead Johnson & Company founded in 1900, Metrecal was just a new trick coaxed out of an old product. 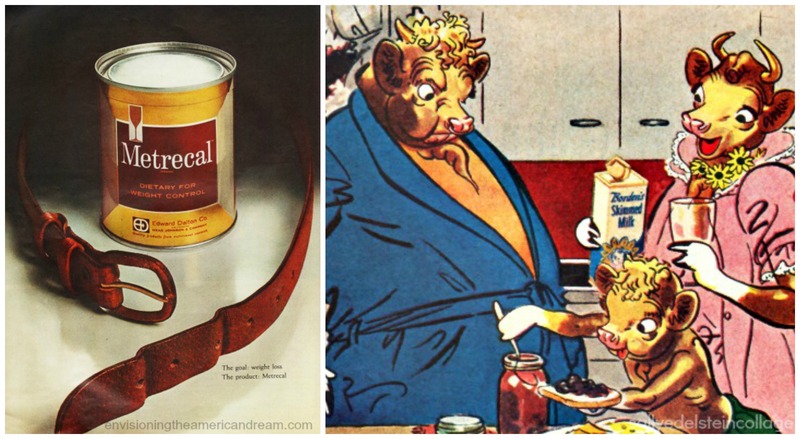 In the great American marketing tradition, Metrecal was really an old product re-marketed to the newly diet conscious population. But nearly 25 years later, concerned that the company was almost exclusively identified with baby products, they set up a research department to develop a diverse line of products. Savvy researchers at Mead Johnson stumbled across an invalid’s food called Sustagen. 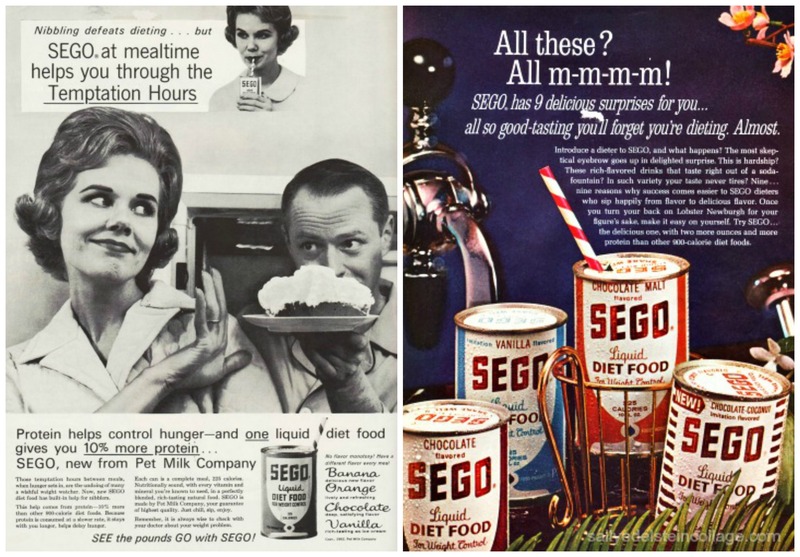 A mix of skim milk powder, soybean flour, corn oil, minerals and vitamins, Sustagen- a precursor to today’s Boost- was designed for hospital patients unable to eat solid foods. It worked so well at giving patients the feeling of having eaten a solid meal and diminishing between meal hunger pangs, that Mead Johnson decided to rename it Metrecal and market it as a weight-reducing food. The only change was to recommend a limit of 900 calories of Metrecal a day. 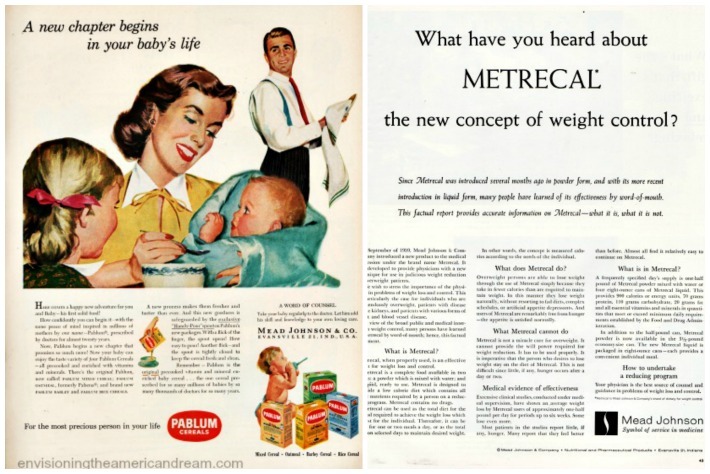 Naturally as a drug company, Mead Johnson wanted to keep the good will of doctors who prescribed most of their other products, so they wisely started advertising Metrecal in the American Medical Association Journal, eventually branching out into general markets. 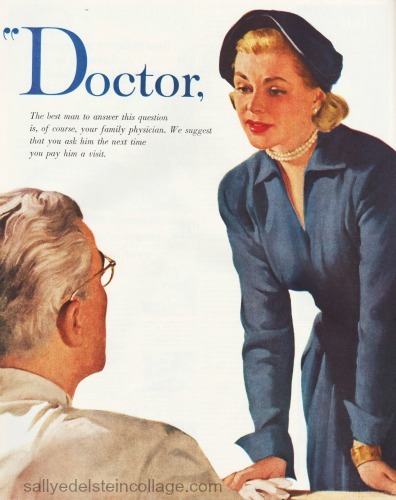 Wisely ending each advertisement with a plug to “see your physician” about weight problems, gave Metrecal that all important AMA stamp of respectability that most other diet concoctions lacked. Like most homemakers, Winnie would never dream of starting any slimming regime without the advise of her trusted family doctor. Once she could eliminate any glandular problem as the cause for her excess weight she was free to enjoy imbibing on the 900 calorie, full-bodied goodness of Metrecal with her doctors blessing. Sternly he also instructed her to avoid undue exercise as part of her slenderizing program as it was counterproductive. Like many doctors, he felt it was of very little value since it was believed that exercise spurred ones appetite. So Winnie would leave Jack La Lanne and his jumping jacks and the good vibrations of a slimming belt at Vic Tannys to others. Adverting began targeting men and weight loss too. (R) In a vintage Borden’s Skimmed milk ad from 1955, Elsie the Cow’s husband Elmo goes on a diet. 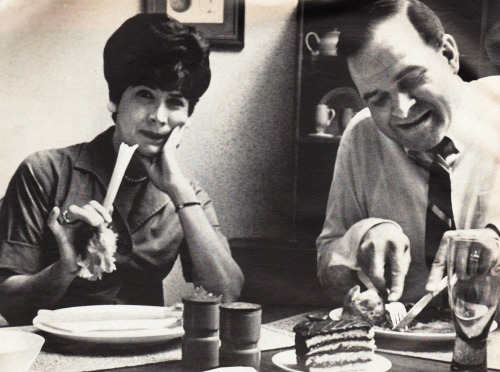 “But dear you don’t have to starve while dieting,” Elsie suggests sweetly to her husband. To which Elmo replies in a blustery tone” “And what’s wrong with my shape?” (L) The Metrecal ad from 1961 is targetting the businessman. Women weren’t the only ones watching their waistlines. If Winnie’s husband jack wanted to cut a fine figure in his cabana set, he might have to do a bit of dieting himself and Metrecal was there to help him too. 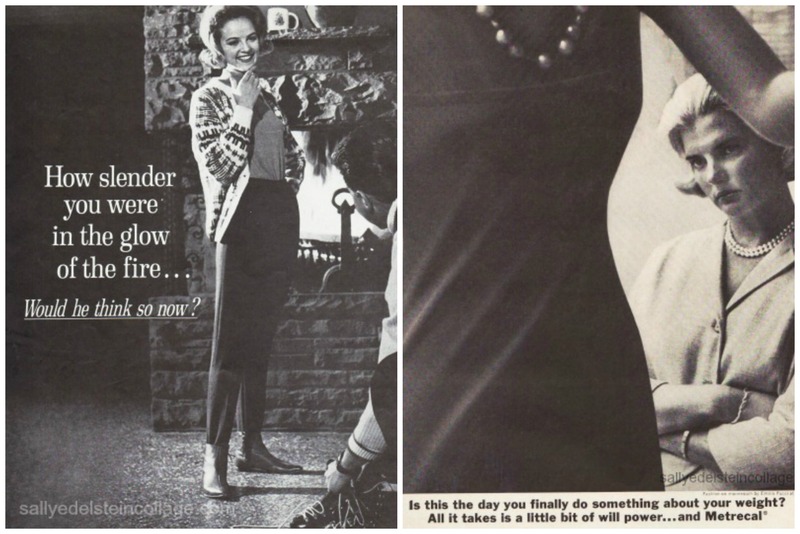 Tapping into the manly world of 3 martini lunches, it wasn’t long before Mead Johnson started targeting men too, expanding their market as quickly as American waistlines grew. Who needs a BBQ? For the beef lovin’ American man, Metrecal promised their tasty can of Metrecal had all the nutrition of a steak and potatoes dinner. If Jack started to develop a bit of a paunch, Mead Johnson suggested he keep those canned Metrecals refrigerated in a desk drawer for his noonday meal joining the Metrecal for lunch bunch. And if he took clients to lunch, he could rest assured, Metrecal was served up the finest establishments. While clients could imbibe on a Blue Hawaii at Trader Vics, the tiki themed restaurant also offered a 325 calorie lunch which was 1.5 ounces of rum mixed with nutmeg and Metrecal. Metrecal was so successful it spawned nearly 40 imitators from other large companies: Sears Roebuck brought out Bal-Cal, Quaker Oat’s pitched Quota, Jewel Tea Company had Diet-Cal; even deep discounter Korvette’s hawked Kor-Val. to name just a few. Winnie’s head was swimming from the choices. 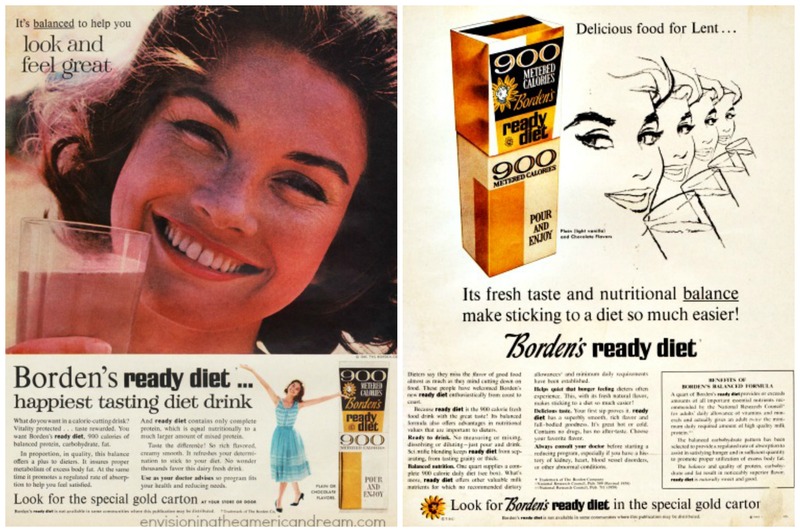 If reliable Elsie the Cow who was apparently watching her waistline too, claimed her product “Ready Diet” was “the happiest tasting drink,” maybe she should try Borden’s rich and creamy elixir. Their scientific blend of 900 full-bodied calories was ready to drink from the gold carton with no measuring, mixing, dissolving or diluting. Focusing on the women’s market, Pet Milk’s popular Sego stuffed more protein and 2 more ounces into the same 900 calories featured by Metrecal. Remember Art Linklater’s kids say the darndest things. This sounds like one of those. A friend of my sister’s was one of the early users of Metrecal. She hoped for that svelte look promised in the advertisements, but, after using it for a couple months, actually picked up weight. She complained about her results to her co-workers, who asked her a few questions. Seems she drank it with her meal instead of as a meal! Used correctly, she had better results, though she never was that thin. That’s pretty funny. It’s similar to tales of people who used to binge on Ayds ( a chocolate candy like appetite suppressant) and ended up gaining weight. Reminds me that doctors used leaches to bleed for just about anything. Maybe that would work for weight loss. I can’t believe the doctor told her not to exercise.